This is a great resource for anyone covering the French Revolution and Napoleon. 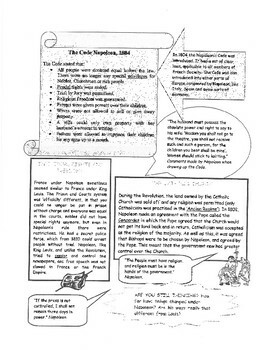 Students will examine and analyze how France changed under Napoleon through a two page guided reading. Students will then answer questions that will test their reading comprehension. 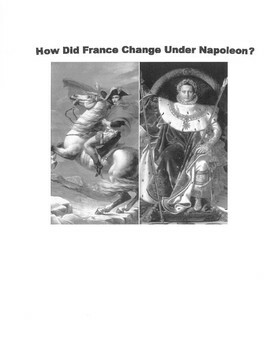 Last, students will determine, through a persuasive essay, if they believe Napoleon was a hero, or a tyrant. 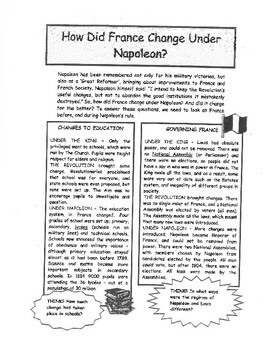 * Resource includes a two page reading about Napoleon and France. * Includes 15 reading comprehension questions. * Persuasive essay prompt that will get students actively engaged in the lesson.